-How do I purchase a unit that is Built By BROSCO? 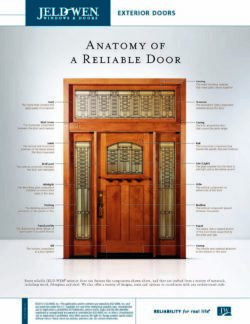 As a leading distributor of quality doors, windows and millwork products in the Northeast, it is easy to locate a BROSCO dealer near you to place an order for your next building project. Please use the dealer locator in the upper right corner to find a dealer near you. -How do I measure my existing Exterior Door Unit? -How long is the warranty on glass for BROSCO window units with seal failure? 10 years from date of purchase. Prior to 1992, it had a five-year warranty. -How much can I trim off a wood door? -Do I have to finish the bottom of my wood door? Yes. All surfaces – Top, bottom, edges, inside and outside must be finished or the warranty will be void. BROSCO Craftsman Prefinishing is recommended. All exterior units that are Built By BROSCO have the bottom finished before we apply the door sweep. -Can I paint my wood door any color? No. Dark colors are to be avoided. -How can I stop sap from coming out of my door? Remove all finish materials from effected areas by scraping or sanding to bare wood. Wash with mineral spirits and allow to dry. Apply two coats of white pigmented shellac and allow to dry before re-applying top coat finish. In 1890, the year following the Great Lynn fire in Massachusetts, a partnership was formed between Louis G. Brockway and C. Fred Smith, under the name of Brockway & Smith. They took over the going concern of Burnham & Company, Mr. Brockway having already purchased the interest of Mr. Burnham, with whom he had been a partner in this business. Brockway & Smith made a very modest start occupying not over one thousand feet of floor space in part of a building located on Broad Street, in Lynn, Massachusetts at the foot of Market Street, formerly known as a hotel by the name of “The Railroad House”. They dealt not only in doors and windows, but in hardware and paint as well. The space on the first floor was used as a store. There were samples of windows and doors, and on shelves in a small space on one side was limited stock of builders’ hardware and paint, while on the floor were kegs of nails, etc., and on the wall hung an old-fashioned telephone, which was used largely by local people to whom its presence was advertised by a sign on the outside of the building. Judged by our present standards, methods of handling materials in those days were primitive. Brockway & Smith did not own any delivery equipment, and trucking was done by horse and wagon owned by a delivery company. Everything had to be hauled from the Lynn Freight Yard and taken to the rear of the building where it was pulled by hand to the floors above through a closet-way built to take such things as glass boxes, putty, kegs, etc. A door opened into this enclosure from the cellar floor. Rope and tackle were also used outside for the same purpose. It was decided to try to enlarge the wholesale business, and in about five years business increased to such an extent that the company moved to Oxford Street, Lynn, where they purchased and remodeled the old A. F. Smith Shoe Factory. During the next two or three years, Brockway & Smith absorbed two other hardware and paint stores, and in about 1898 they moved across the street to what was, at that time, one of the best business blocks in Lynn. This was on Munroe Street. They still carried on the mixed business of doors, windows, hardware and paints, but at this time they included a jobbing business in all lines. In March of 1898 the firm was known as Brockway & Smith Incorporated, and from that time until February 1928, it was known as the Brockway Smith Corporation. In 1905 such extensive Pacific Coast connections were established for the distribution of western doors, then new into New England, that they were able to retire from the paint and hardware business and moved their headquarters to Boston at 18 Washington Street North. They still maintained their Lynn warehouse. Deliveries were made by horse drawn wagons until 1905 or 1906 when, shortly after moving to Washington Street North, they purchased a truck. This truck gave them plenty of trouble, for although it started out regularly with a load, it frequently had to be hauled back by a pair of horses. The truck was finally sold, and for a short time, horses were again used. In about 1910, the plant formerly used by the National Biscuit Company at 465 Medford Street, in Charlestown, Massachusetts had been rebuilt into a warehouse which, with its side tracks and waterfront, made an ideal location for a sash and door warehouse. The main office, however, remained at Washington Street, Boston, until 1912 when it was moved to 98 Canal Street, Boston. In 1914, the Brockway Smith Corporation absorbed E. A. Carlisle, Pope & Company of Boston, and in 1915 the firm of Cutter, Smith & Company of Roxbury. In 1923-24, a new five-story concrete building was erected at the Charlestown warehouse location, and on May 10, 1924, The Brockway Smith Corporation moved its offices and consolidated its entire plant at Charlestown with the exception of a small branch sales office that it still maintained at the corner of State and Pleasant Streets in Lynn. The Lynn office was given up entirely in 1944. In early summer, 1926, a new warehouse was established in one of N. T. Fox’s buildings at Morrill’s Corner, Portland, Maine where it remained until it was destroyed by fire in 1936. It was at that time that the plant was moved to Richardson’s Wharf, 276 Commercial Street, Portland, Maine. On January 30, 1928, a merger took place between three companies in the same line of business: The Brockway Smith Corporation, Jackson & Newton Company, Lovell & Hall Company, and the Company became known as the Brockway-Smith-Haigh-Lovell Company. Want to learn more about building materials. Take a look at Brosco’s GLOSSARY OF TERMS!